Please note that the content of this book primarily consists of articles available from Wikipedia or other free sources online. 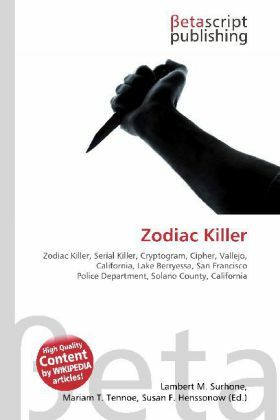 The Zodiac Killer was a serial killer who operated in Northern California in the late 1960s. His identity remains unknown. The Zodiac killer coined his name in a series of taunting letters he sent to the press. His letters included four cryptograms (or ciphers), three of which have yet to be solved.The Zodiac murdered victims in Vallejo, Lake Berryessa, and San Francisco between December 1968 and October 1969. Four men and three women between the ages of 16 and 29 were targeted. Numerous suspects have been named by law enforcement and amateur investigators, but no conclusive evidence has surfaced.